They start at the bottom of the pelvis at a place called the ischial tuberosity and are innervated by sciatic nerve. They cross the knee joint and end at the lower leg. The short head of the biceps isn't considered part of the hamstrings because it's a monoarticular muscle and have not origin at at the pelvis like the others. The hamstrings are are biarticular muscles because they cross the hip and knee articulations, and the main function of this muscle group is to trasfer the muscle power between the articulation they cross and at the same time coordinate flexioin/extension of the thigh. The Semimembranous and Semitendinous muscles, co-work also for the intra-rotation of the leg (when the knee is flexed) while adduct and intra-rotate the thigh. 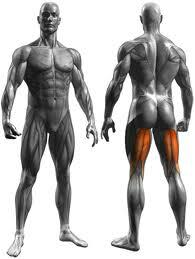 So, the main function of this muscle group is carried out during walking and running. Furthermore they are very stressed during activity like sprinting, mainly at the end of swing phase of the gait cycle, when they are in contraction while lengthening (Eccentric contraction).